Pita bread is a type of flatbread which is a staple of the middle east. It is commonly referred to as Khubz in Arabic but it is commonly known as Pita bread in other parts of the world. This flatbread is made from a soft yeasty dough similar to the pizza dough. 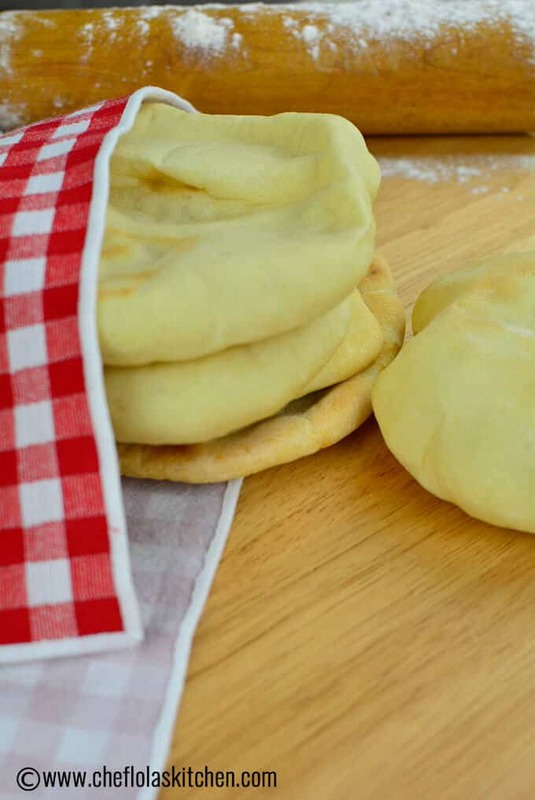 This homemade Pita bread requires just 5 ingredients and you will have a Soft, fluffy, pillowy texture and tasty bread. This makes a great accompaniment to Chicken Shawarma. This is my staple pita recipe! 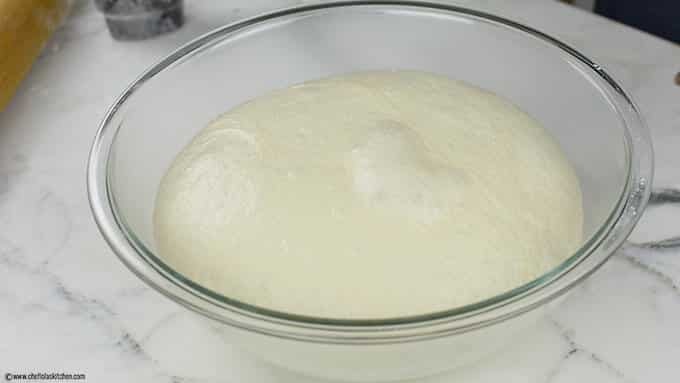 The sponge: In a bowl combine the Flour, yeast and sugar leave to froth for about 10 minutes. Make sure the yeast blooms before you continue with the recipe. 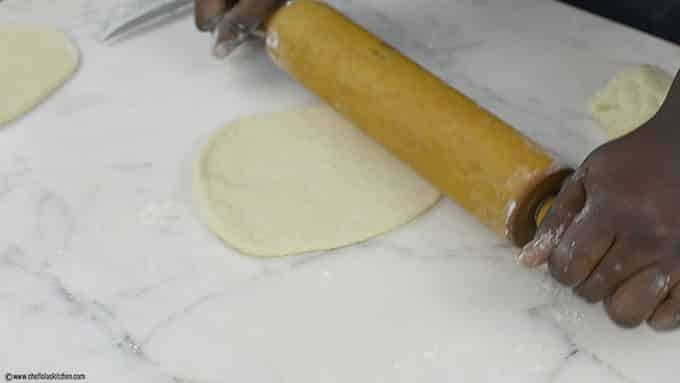 The flat bread dough: Mix the sponge with the flour and salt and mix till well combined. Knead the dough. knead the dough for about 5 minutes. Don’t over- knead, it’s not necessary. Also, try to avoid the temptation of adding excess flour to the dough. The dough has to be wet. The water in the dough will be converted into steam which will, in turn, cause the flatbread to puff up and form a pocket. The Rise: This is the longest part of the recipe, but I’m happy because this part is not hands on. 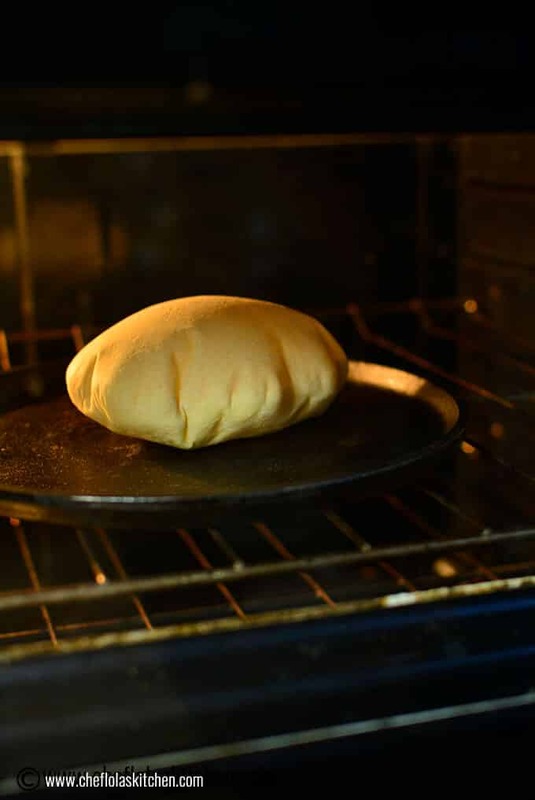 Bake: Who gets that thrill, when the bread balloons in the oven? Looks like what will get kids excited but somehow it gets me excited as well. 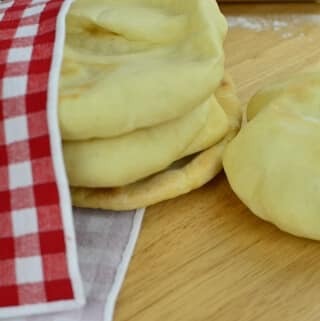 If you follow the recipe you will end up with a beautifully puffed up pita bread. This Pita bread just like any flat bread is very versatile and it makes a satisfying accompaniment to many meals such as hummus, sauces, stews, a base for pizza, a filling for sandwich or shawarma and many other. Make sure you don’t leave your dough to form a crust at all. Keep it covered at all times. I usually roll out to about a 1/4″ to 1/8” thickness this gives enough room for pocketing. The pan you cook these on has to be very hot. I like to preheat my pan when I’m preheating my oven. If the pan is cold, it may slow down the formation of the pocket. A very hot Oven! I baked at 475°F. Pita bread is a staple bread of the middle east. It is commonly referred to as Khubz in Arabic but it is commonly known as Pita bread in other parts of the world. This bread is made from a soft yeasty dough similar to the pizza dough. In a bowl, mix the water, yeast, and Wheat flour and leave for 5 to 10 minutes to froth. 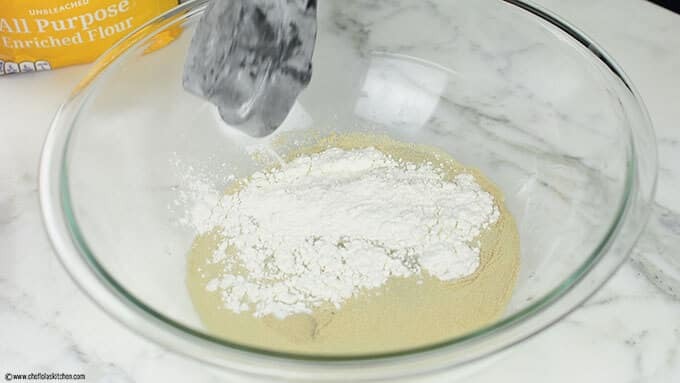 Add the flour, Salt, and Olive Oil to the mixture above and mix until a shaggy mass of dough is formed. 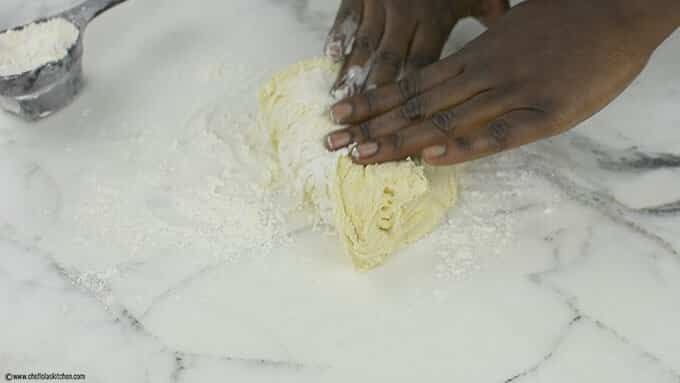 Place the dough in a clean bowl and lightly oil the dough with some Olive oil turning to coat evenly. Cover it with a tight fitting lid and leave in a warm place to rise for 1 hour or till doubled in size. Punch down the dough return to a lightly floured work surface. Divide into 8 parts and roll out each piece into a circle of about a quarter of an inch thickness. Cover with a damp kitchen towel and proof for another 10 to 15 minutes. 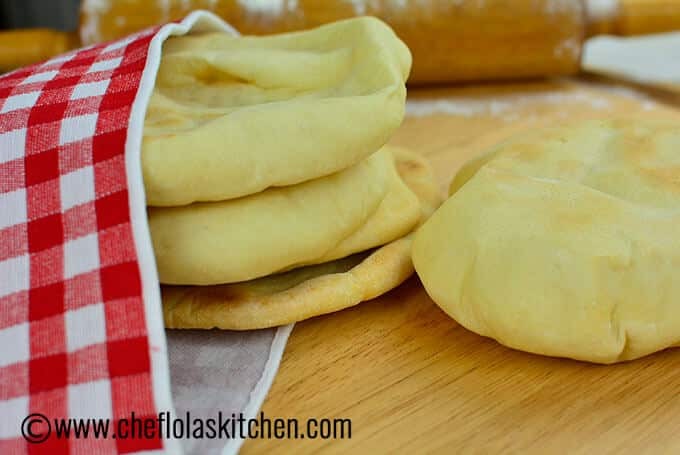 Preheat the oven to 475 degrees F with the skillet or baking pan in the oven and cook the dough for 2 to 3 minutes on the first side or till puffy. Flip to the other side and cook for 1 more minute. Don't kill your yeast with hot water. You need warm water. I personally don't use a thermometer to measure the warm water temperature, Try not to overbake the pita otherwise, you will end up with a cracker Cooking the flip side of the dough is optional, however, you can choose to cook it for few seconds to a minute if you choose to. In order to keep the freshly made pita bread from drying, cover them immediately with a damp kitchen Towel after cooking them. Addition of wheat flour is a good idea if you choose to. I have done that with this same recipe and it came out beautiful. For storage, keep this flat bread in a sealed plastic bag and keep in a cool dry place for about 5 days, in the freezer for up to 3 months. Refrigeration is not advised because the bread will dry out faster and become stale. Hi,Lola.great recipe.mine turned out well.pls could you do a video on tortillas. I need it to make your sharwama recipe.I can’t find tortilla wraps in my area.thanks. Thanks for the feedback Favour. I will try and work on your request.